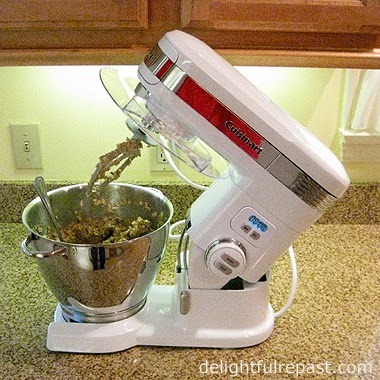 A food blogger without a heavy-duty stand mixer? Shocking! I was probably the last food blogger on the planet who did not own one, but that has all changed. Yes, I've always made most of my breads, cakes, pies, cookies ... entirely by hand or with a partial assist from either my trusty food processor or my most definitely light-duty mixer. But the time had come to resort to a labor-saving, time-saving device. So the research began. After considering the pros and cons of all the possibilities--and knowing what a reliable workhorse my Cuisinart DLC-10E food processor (that I've had since I was a mere girl) has been and still is--I decided on the Cuisinart 5.5-Quart 12-Speed Stand Mixer (it also comes in a 7-quart model). Fairly reasonable footprint: at 15.5x10x12.5 inches high (and a hefty 21 pounds), it fits under my upper cabinets and doesn't take up too much valuable real estate in my average-size kitchen. Comes in three colors: white, black and brushed chrome. I went with white. Call me dull, but even if I had gotten a mixer that comes in a vast array of colors, I would have gotten white. Bowl and attachments can go in the dishwasher (ever since I got a dishwasher, I want to put everything in it!). Great manufacturer's warranty: limited 3-year product warranty and a full 5-year motor warranty. The 5.5-quart bowl can handle 12 cups of flour; double batches are no problem. Made a huge batch of cookie dough--enough to freeze dozens of ready-to-bake cookies! When you tilt the head back, the splashguard comes up. And the splashguard has a really handy spout for adding ingredients. Slow-start and gentle-fold (continuous or pulse) functions. Believe me, the mess-saving slow-start function will come in handy for someone whose husband sometimes calls her The Black Tornado (a reference to an old commercial for a cleaning product nicknamed The White Tornado). The 15-minute countdown timer with auto shutoff. If you'd like to win one of these fabulous Cuisinart mixers (color of your choice), see below. And come back next week for a recipe! I post every Thursday (but I posted a day early this time because I am so excited about this mixer and giveaway!). Follow me by email so you'll never miss another recipe (box in right column). Watch for my new recipes for big batches of cookies, breads, and more in the coming weeks. This giveaway is open to US residents 18 years of age or older. Leave a comment below (one entry per person) that includes your color choice (black, white or brushed chrome) and the first thing you'll make with it. Please include your email address in the body of your comment. Must enter by 11:59 p.m. Eastern time Wednesday October 9. Winner will be chosen by random drawing and be announced here in the comments before noon Eastern time on Thursday October 10. If I don't hear back from the winner of the random drawing by noon Eastern time Sunday October 13, another drawing will be held and a new winner selected from the original entrants (those who commented before the giveaway deadline). Follow Cuisinart on Twitter; like the Cuisinart Facebook page. 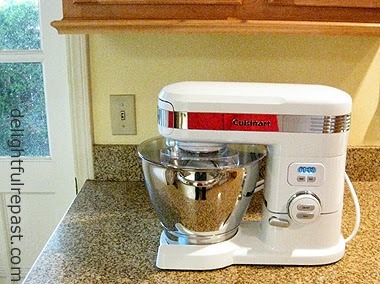 Disclosure: Cuisinart provided a mixer for review purposes and a mixer for the giveaway. I received no compensation. The views expressed here are entirely my own. I always tell my readers what I really think! My hand mixer always sounds like it's going to fail me whenever I make cookies. Would love something durable like this (in black ;) ) I brought some store bought peanut butter cookies home last night and all the girls talked about was how good my homemade ones are, so I think first up would be peanut butter cookies. This looks like a wonderful mixer! A black one would make a good cookie experiment even better. Ommnomnom...dozens of Christmas cookies to give to friends and family. I would love the white mixer and would make Christmas Coffee Cake. Yum Yum!! fiveburnersataoldotcom. Good heavens, I haven't had the pleasure of using a stand mixer since my old one died 25 years ago! I'd love to have a shiny new black one on my counter, just in time to make pumpkin bread....er, butternut squash bread in my case. Or maybe I'd give in and treat the dogs to some homemade peanut butter molasses dog biscuits, or your delicious Angel food cake (which has become a staple in my house)......I could go on and on with the list of things I would make! My, oh my ... it looks gorgeous! I really like the idea of the splash shield that lifts when you lift the beaters ... very handy. I'd love one in black and I'd make a double batch of chocolate chip cookies for my husband who adores them. I would choose the brushed chrome and I would make a cinnamon bread. The first thing I would make would be pastry for my mother's old time Welsh recipe for iced squares, or what we found in the bakeries over in Britain were. Known as custards slices. If I were chosen as the winner I would love to have the white ones please! Thank you for the opportunity to enter, and have a great day! I would make chocolate cookies and peanut butter cookies and date-nut cookies and someone would have to stop me! I would love a chrome one. I'd pick the brushed chrome and the first thing I'd make would be... gingersnaps! Great giveaway! I like the white one, and it's just in time to start making holiday cookies! What a great give away, Jean! My stand alone mixer was just giving me fits a few weeks ago!! I'd really like the chrome, although white would go better with the other appliances in my kitchen. And what would I make first? Goodness... so many choices, but it would probably be my favorite cookie - chocolate chip!!! I would love to win this mixter.. I have four kids so it would be used a lot..
An awesome giveaway! Good luck too ALL! If I am chosen to win, I'd like a black one. Okay, Jean since it's true confessions, I'll admit I still don't have a microwave oven and my mixer is a puny hand-held one. Yes, I tend to do everything by hand. Okay a white mixer would do the trick. First use? Pumpkin Pie with whipped cream topping. A chrome mixer would be lovely! 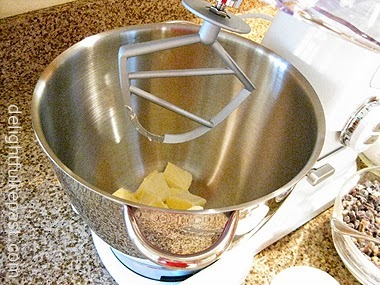 I just downloaded a beautiful recipe for potato bread, so I would love to use this mixer for that! I would be using the chrome to make chocolate chip cookies (I won't say how many hand mixers I've burnt up over the years making cookies). This seems like it would be harder for me to "destroy," they could possibly even be chocolate chip oatmeal cookies. What a nice giveaway! I found you from David Leite's RT. I don't have any sort of electric mixer, so this would be a quantum leap for me. If I am the lucky winner, I would choose white, please, and the first thing I'd use it for would be a big batch of dough for breads and dinner rolls. I'd love the white mixer! I'd make all kinds of cakes and pies and sweets for halloween, christmas, easter. I think I will become the baking queeen if i I win this.I don't have a mixer at all! I make these fudge peanut butter brownies that takes forever to hand mix. this would be really great for that!!! Cool WMD (Wonderful Mixer Doodad)! Think I could see one of those in the kitchen and another one in my basement workshop. And white works, though I think I’d take black…or maybe chrome…still, white – no, black. Definitely black. Red, though… Anyway, here’s my email mn222mn@earthlink.net . You do have a straightforward, dependable, exhaustive and objective approach, if I may say, Jeani. Love your reviews! This looks lovely. It would go well making my favorite artisan bread recipe. I would want a black mixer if I won and I would definitely make cookies with the kids! Much easier for them to use then a hand mixer. I would choose the brushed chrome & make Homemade Marshmallows first off! Thanks! The Cuisinart 12 Speed Stand Mixer in brushed chrome would blast me through my holiday baking. The first thing I would make is mountains of holiday cookies of every variety in a jiffy! I would make a snickerdoodle cake - I found a recipe for it just today and it looks amazing! Jean, a lovely looking mixer. When I see a machine as nice as this I always think of my brother Michael. He did a physics degree and now specialises in ,"sound and vibration,"
Does this mixer purr like a cat or roar like a Ferrari? That reminds me of something I forgot to mention in the post, Tony. This mixer is very quiet, purrs like a kitten! I've been enjoying teaching my children to bake, and winning a mixer like that would be such a blessed treat! We love brushed chrome appliances. So classy. When I asked my husband about the first thing he would make (he's the chef, not me), he immediately responded "PASTA"! He has an Italian mom and grew up with homemade pasta of all kinds. He bemoans the fact constantly that we have no mixer to make the dough. I would pick the brushed chrome. My dd and I would make red velvet cake for her daddy! I love baking! It has always been a passion of mine! The first thing I would make is Double Chocolate Mint Cookies! 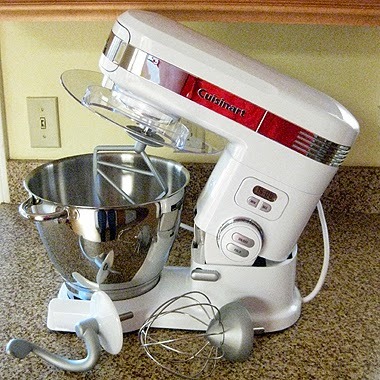 They're one of my favorite cookies and I would love the mixer in Brushed Chrome please! While I first thought I would most like the chrome finish, after visiting the Cuisinart webstore and seeing the black, I would select this color. I like the contrast between the dark of the stand and the steel color of the bowl, very sleek and posh. I would like the brushed chrome, it would match everything in my kitchen. I would first make some breads for the upcoming holidays. I would make cookies, and I would love black! I would LOVE to have a( brushed chrome) mixer...to make the first pumpkin cheesecake of the season. i would love to have it in black if i win, thanks for the chance. I would choose the white and the first thing I would make is banana bread! I would love to make some gluten free chocolate sunflower butter cupcakes. They're too hard to do by hand!! Would love the black to match with the rest of my decor. I would like brushed chrome and I would make a cake. Black and I would make fruity cheesecake with it. I would choose the Chrome to make a caramel cake with Salted caramel icing. One can never have too much caramel!! The first thing I would make would be cookies because I am terrible at making cookie dough. It's so firm and I always leave clumps or my hand gets tired! I like the mixer in black and the first thing I would make would have to be banana nut bread. Everyone here loves it and I really love making it. This is so cool. How did I not know that Cuisinart made stand mixers? I would like the black and the first thing I would make is whipped shortbread. I would love this mixer in brushed chrome. First product from this mixer: lemon squares!~ Lovelovelove lemon squares. Any color. Gluten free cookies! I would love to make a cake! I would choose the brushed chrome! I would make my grandmother's chocolate cake with chocolate / almond frosting! *Giveaway Winner Announced* - The winner, by random drawing, of the Cuisinart SM-55 heavy-duty stand mixer is Ann (theelegantshoestring). Ann, as soon as you send me, delightfulrepast at aol dot com, your name, address, phone number (required by shipper) and color choice, Cuisinart will ship the mixer to you. Congratulations! If I don't hear from the winner of the random drawing by 11:59 am Eastern time Sunday, October 13, another drawing will be held and a new winner selected from among the original entrants (those who commented before the giveaway deadline).